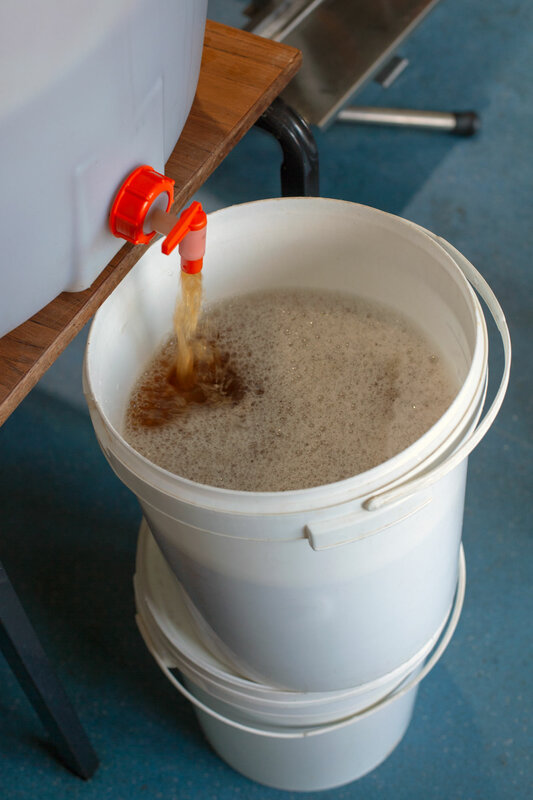 I attended the charity’s Annual General Meeting on 23 November in Brighton, UK, and volunteered on the 26th for a day at their Fruit Factory, where we pasteurised five hundred bottles of apple juice. The fruit-related activities of the trust are gaining momentum. Created on the South Coast of England in 2000, ‘Brighton Permaculture Trust is a charity that promotes greener lifestyles and sustainable development through design’1. One of the ‘three main themes’ of the charity’s projects is ‘growing and using fruit as well as related land management’. ‘Examples include helping communities and schools plant orchards, involving people in picking and processing fruit, and exchanging knowledge and expertise with partners both locally and internationally’2. Two of the bottles I purchased in 2016 at the Fruit factory in Stanmer Park and brought back to France. Photo 30 December 2016, Aurillac, France. On 23 November 2018, I attended the Brighton Permaculture Trust’s Annual General Meeting. I find initiatives aimed at using local fruit like the Fruit Factory very interesting to track, so I wanted to see how the project has evolved since my last reading of the charity’s accounts two years ago. At its 2017/18 Annual General Meeting, I was very pleased to realise that the Brighton Permaculture Trust was well on its way to meeting its long-term targets at the Fruit Factory, with ‘15,252 kg fruit collected and used so far this season’4. It was also great to see that the organisation has the financial resources to pursue its development and will for instance, as part of its plans for 2018/19, ‘consolidate the role of the ‘fruit’ component of the Trust’s assets, by completing the Fruit Factory with the aim of making it fully operational within the year’5. I find these initiatives interesting in terms of sustainable development. They are live experiments which I believe will make local production take off and become more prominent among the food categories and brands people can choose from. In my view, local production won’t continue to be perceived as an idealistic solution for cutting down on food miles and improving community life, but will start to represent an actual force impacting on food consumption and local activity regeneration. Other organisations carry out this type of project in Europe. I find it significant for instance that the volume of fruit collected and used at the Fruit factory this year, fifteen tons, was the same as the volume of local fruit processed by Les Croqueurs de pommes du Jura – Petite Montagne to make apple juice in the North East of France. This local branch of Les Croqueurs de pommes, the French association of which I am a trustee6, told me about their project this autumn. As in the case of the Brighton Permaculture Trust, results were not achieved in one day. It has taken more than ten years of volunteer commitment, a clear vision of what they wanted to achieve and progressively heavier financial investment in recent years to increase production capacity and productivity. The figures are promising. But how does the Brighton Permaculture Trust meet its targets? How does it implement its production at the Fruit Factory? I wanted to figure it out. At the end of the charity’s AGM on 23 November, we had dinner prepared with fruit and vegetables produced by the trust at Stanmer Park. It was an opportunity for me to have a discussion with the trustees and the operations team. I expressed my interest in seeing the new fruit processing equipment at the Fruit Factory, and was invited to visit. On 25 November, I registered online to contribute as a volunteer on the 26th. The job was to add extra flavours to freshly pressed apple juice and pasteurise it. That way, I would see how the fruit processing unit works and the changes it has gone through since my last visit. I would also experience being a volunteer for a day in that place. On Monday 26 November, I joined the team of volunteers at Stanmer Park from 10am to 4pm. The captioned pictures below describe what we did. 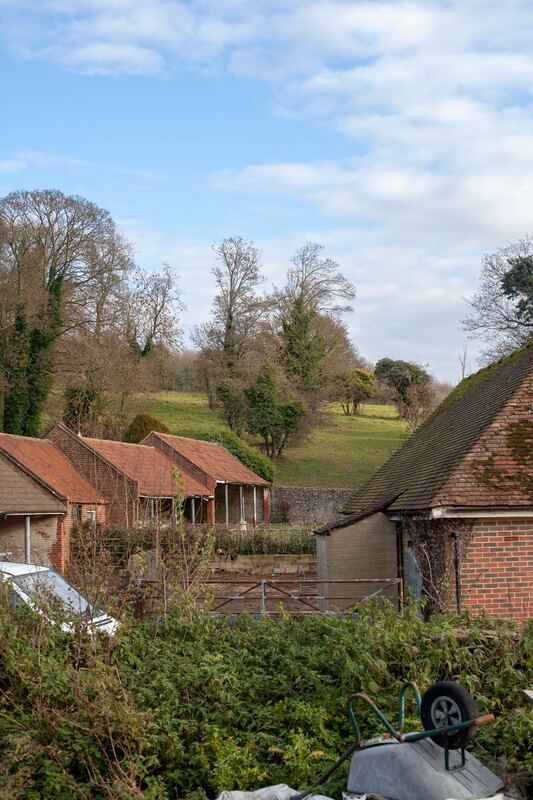 Stanmer Park, seen from the Brighton Permaculture Trust Fruit Factory. Photo 26 November, Sussex, UK. We were three volunteers. It was my first day as a volunteer for this charity. Jo and Becki have been volunteering for a bit more than a month. To the right : Stephen, who managed our work. He has contributed to the Brighton Permaculture Trust activities since 2003. The juice, pressed on Saturday and Sunday, was left to decant before pasteurisation. 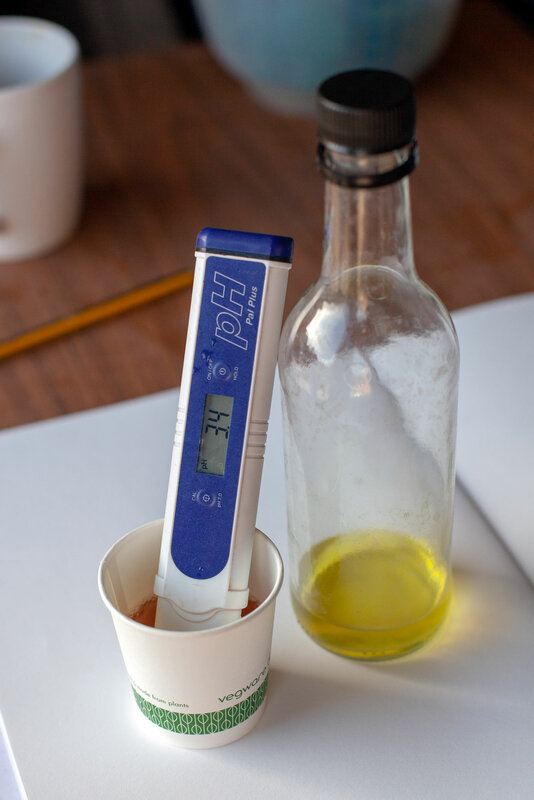 Checking the juice is acidic enough. 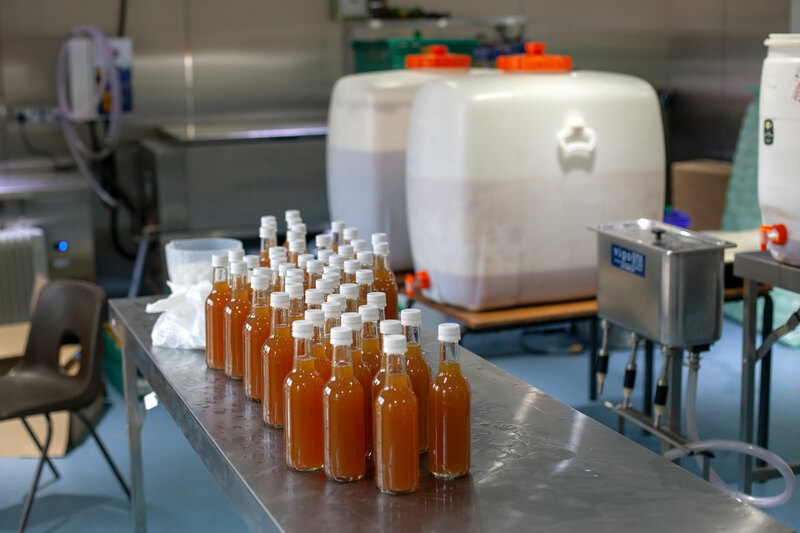 Stephen follows the pasteuriser’s manufacturer guidelines to make his juices: ph up to 3.5, 33cl bottles to be pasteurised for 15 minutes at 75°C for the juice to keep for eighteen months. At the Fruit Factory, several variants of juice are produced. For instance plain apple juice, with ginger, or more elaborate mixes of spices and herbs that Stephen has been trying over the years. On Monday 26, we flavoured the apple juice with mint, to make a nutritious refresher for next summer. 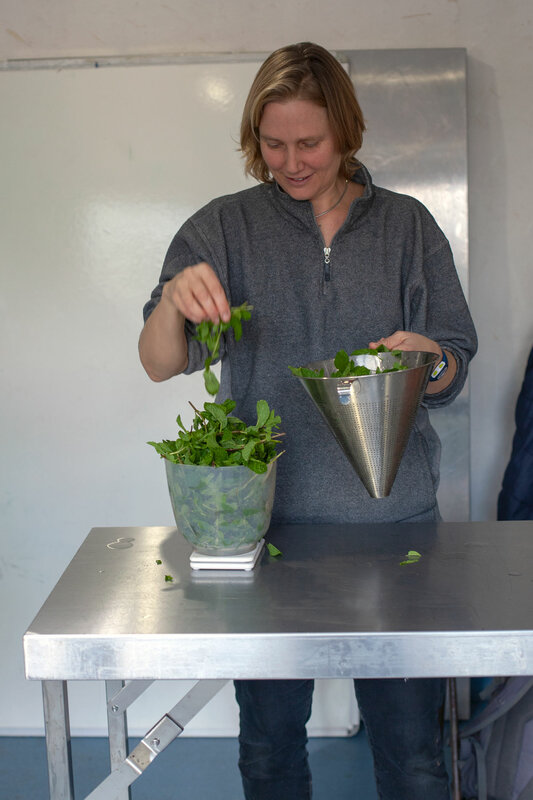 Here, Jo is weighting the mint. 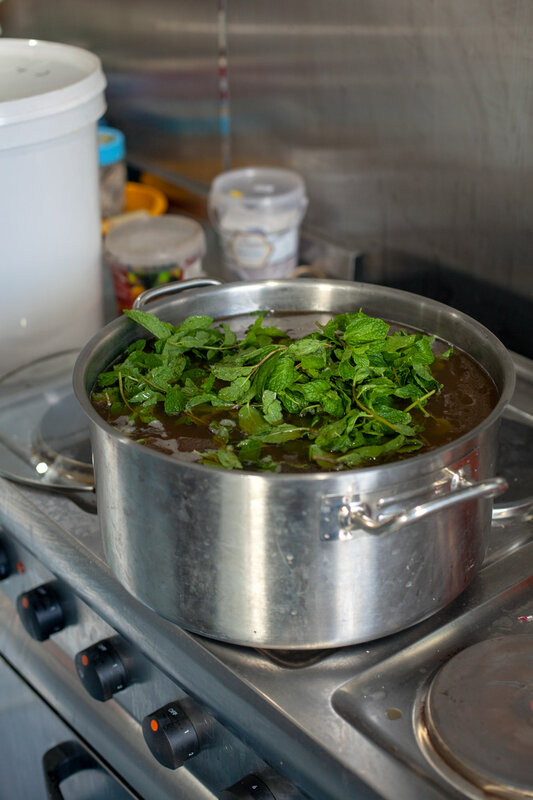 To make a concentrate of mint flavour, a kilo of mint was simmered on a gentle heat for thirty minutes in four litres of apple juice. 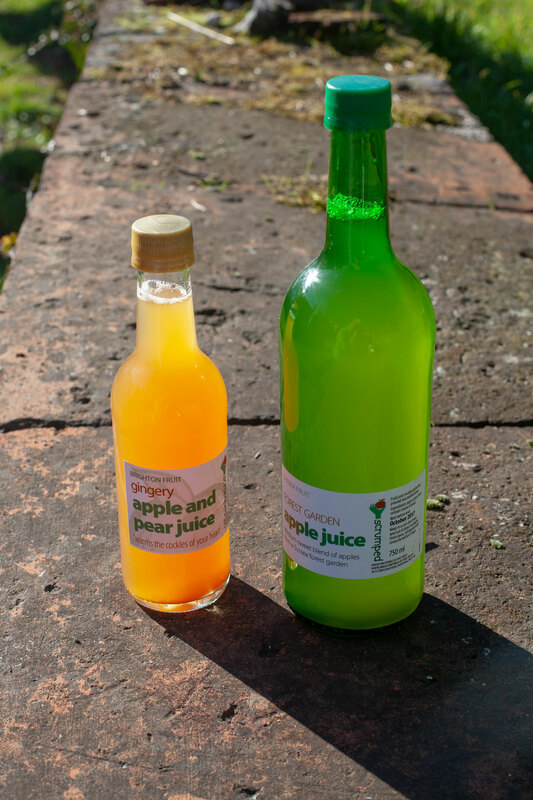 Four volumes of plain apple juice were then added to one volume of concentrate to make the final product. The trust acquired useful devices relatively recently. Filling the bottles now goes much faster. Screwing on caps. Both bottles and tops were rinsed before use, in particular to remove any broken glass. 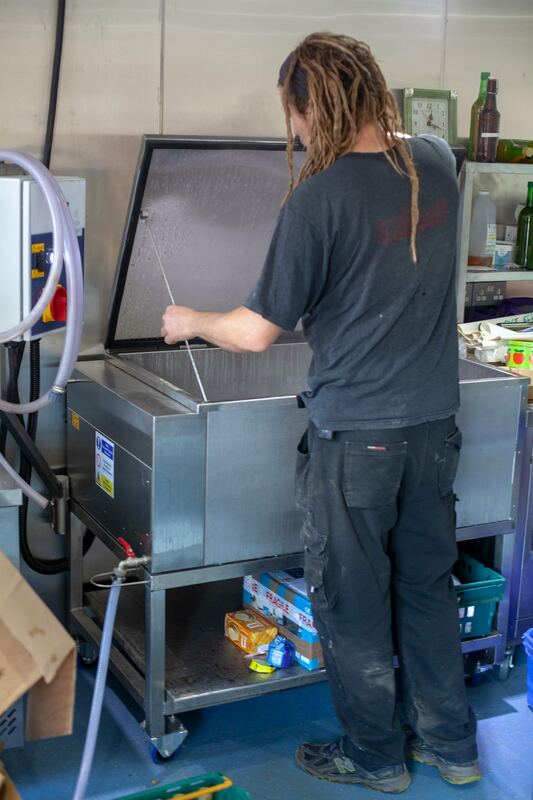 Stephen opening the pasteuriser, also recently acquired by the Fruit Factory to increase productivity. I counted 170 33cl bottles in the pasteuriser. 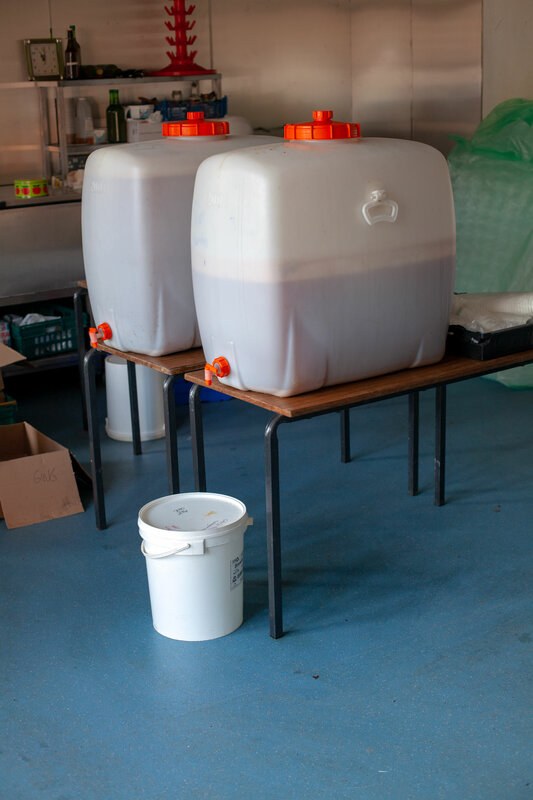 We made three batches during the day, over 500 bottles in total. When the bottles are taken out of the pasteuriser, they need to be left to cool down horizontally. 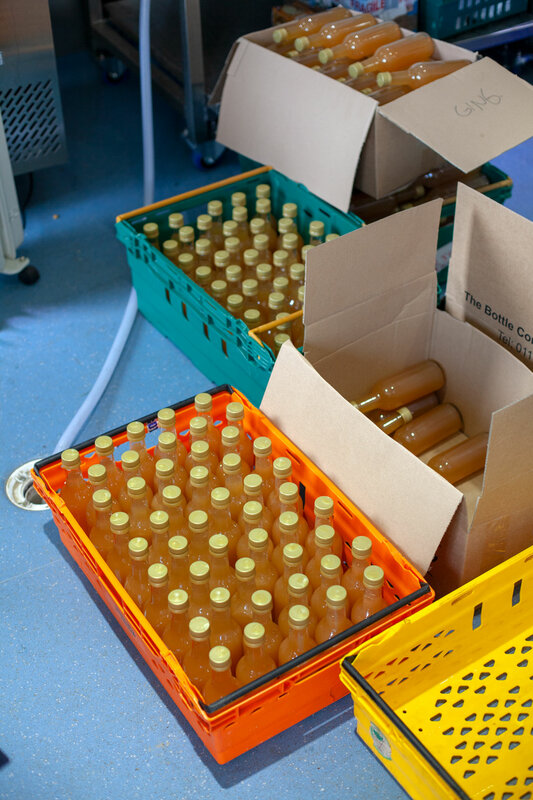 On Monday 26, we put bottles that were pasteurised on previous days upright in plastic crates. A slightly wider view of the space we worked in. 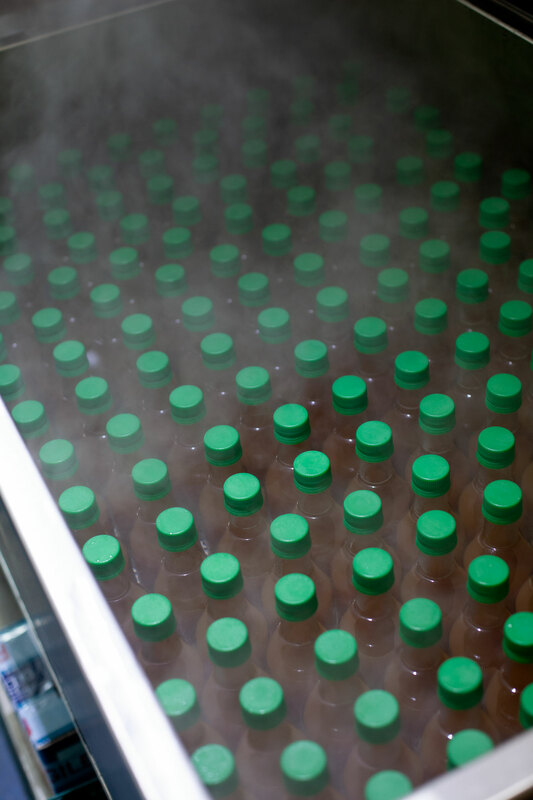 Some of the bottles of apple juice with mint we made, before we placed them in the pasteuriser. The colour of the caps enables Stephen to identify the variants. I have very good memories of this volunteering experience at Stanmer Park. It was great to actually contribute to the production of the Fruit Factory. The four of us talked a lot throughout the day, while doing a job that was easy to carry out under Stephen’s supervision. At the end of the afternoon, Stephen asked me how repetitive I found the tasks. For him, who produces much more frequently and on a much larger scale than I do, manually screwing on hundreds of caps a day has become a sort of ritual. I replied that I fully understand this. When I make jam for family and friends, or simply cook every day, I experience repetitiveness too, which might feel a bit boring after a while. However, there is the pleasure of making, and a fulfilling feeling of accomplishment when the job is done. Stephen and I feel the same. At Stanmer Park on 26 November, I also witnessed the productivity gains made possible by the use of proper equipment. For instance, the three nozzle bottle filler saves a lot of time. It enables the volunteers to synchronise their work, one filling the bottles and one screwing the caps. A third person puts the bottles in the pasteuriser. Of course, we are far from the productivity of automated systems used in food manufacturing, which rinse, fill and cap thousands of bottles an hour7. But the Fruit Factory is not about industrial manufacturing, and in particular the working environment is much more pleasant, with no machine noise. I also find the productivity gains a powerful motivational driver to produce more and better. As a volunteer, being in a well-equipped production unit made me wish to increase the pace and precision of my gestures, and to align with my colleagues to produce more efficiently. 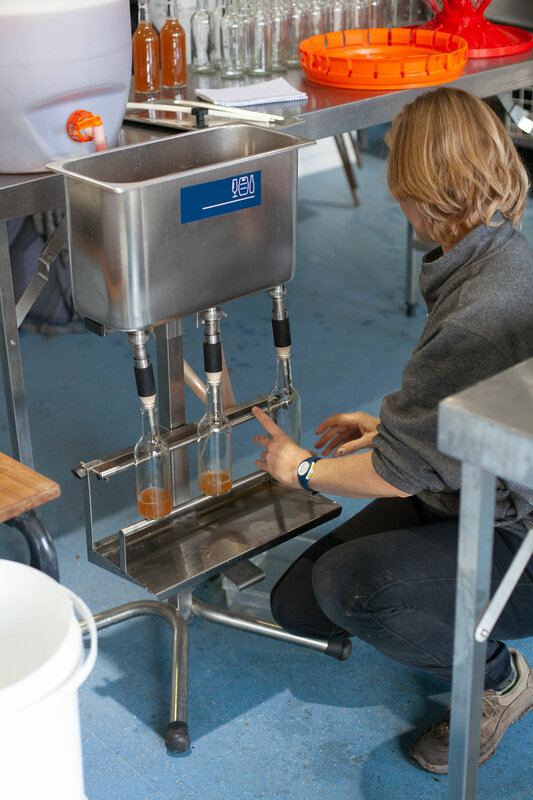 Stephen also mentioned the convenience and the pleasure of working with the Fruit Factory’s new pasteuriser, and I have heard the enthusiasm of Les Croqueurs de Pommes du Jura – Petite Montagne telling me about the benefits of their improved fruit juice production line. 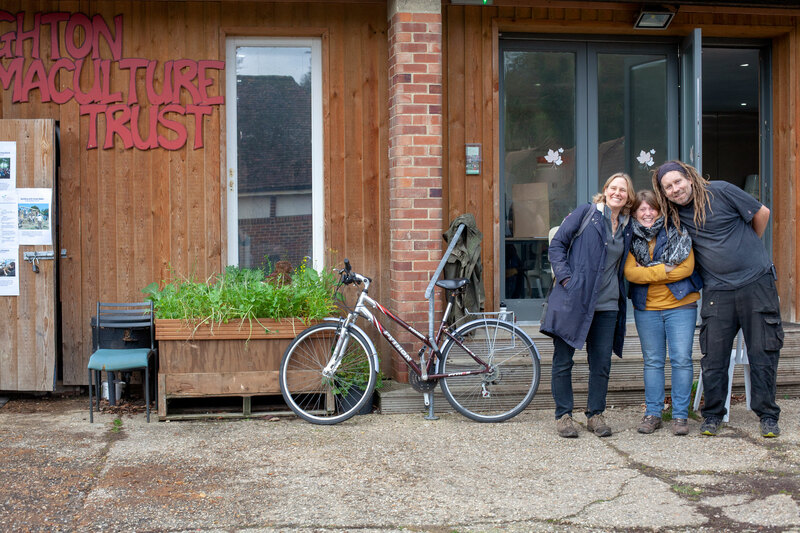 These elements combine to create a positive dynamic at the Brighton Permaculture Trust. It sounds like the Fruit Factory will succeed in collecting and processing forty tons of fruit a year sooner rather than later. 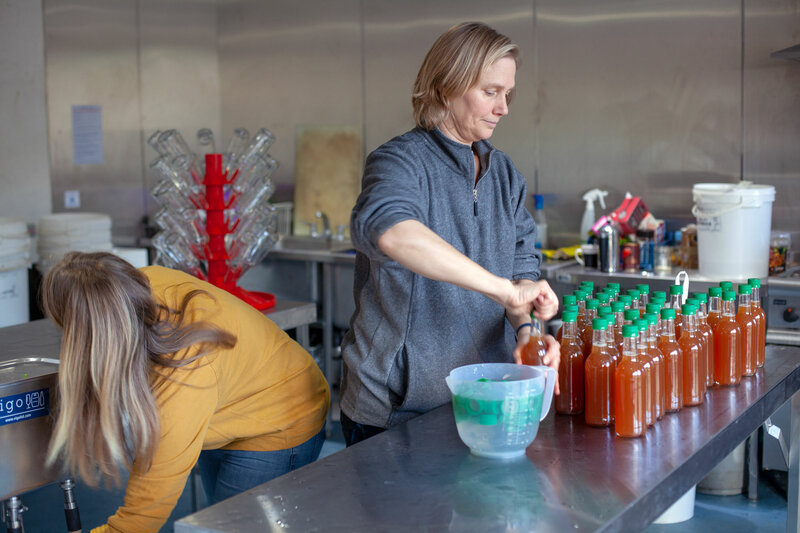 If you want to contribute to this achievement through volunteering at the Fruit Factory, or to any other activities of the trust, please go to Brighton Permaculture Trust / Upcoming volunteer opportunities to find out about what’s currently on offer and register. Meaningfulness and fun guaranteed! https://brightonpermaculture.org.uk/about (accessed 30 November 2018). https://brightonpermaculture.org.uk/about/ourwork (accessed 30 November 2018). https://brightonpermaculture.org.uk/orchards/scrumping (accessed 30 November 2018). https://brightonpermaculture.org.uk/images/events/agm/bptreview1718.pdf (accessed 30 November 2018). https://brightonpermaculture.org.uk/images/events/agm/bptaccounts1718.pdf (accessed 30 November 2018). https://croqueurs-national.fr/en/ (accessed 30 November 2018). https://www.comacgroup.com/bottling-machines/automatic-bottling-systems-up-to-4000-bph-pet-glass (accessed 30 November 2018). This entry was posted in Fruit for sustainable development and tagged Sussex, UK by Les Jardins d'ici. Bookmark the permalink.